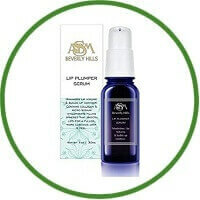 This lip plumper serum effectively increases lip volume for luscious, soft lips. Enhances lip moisture retention while protecting against environmental aggressors that cause premature aging of lips. With regular usage, this lip plumper serum will define, plump and minimize fine vertical lines of the lips. Our lip plumping serum consists of very small particles of Sodium Hyaluronate, which swell when they are in contact with skin water. Produce a long-term boosting effect on the lips. Also, contains tripeptide-1 which protects the lips against the harmful effects of sun exposure. It prevents against the loss of collagen elasticity for healthy, fuller lips. Hydrolyzed collagen is a combination of small peptides that effectively penetrate the skin’s surface to increase the density of collagen fibrils and fibroblast. Effectively moisturizes skin and encourages healthy collagen production. Helps skin look younger by reducing the appearance of fine lines and wrinkles. As a powerful antioxidant, it also helps protect skin from harmful free radicals in the environment.